Are you tired of chasing the mythical 12% return in the stock market? Or maybe you’re frustrated with sinking your money into real estate that doesn’t bring the returns they did a decade ago. And I sincerely hope you’re not letting your hard-earned dollars fester in a bank account that’s not paying even a full percent interest. No matter where the advertising and marketing world goes, billboards are a mainstay in today’s society. Whether you’re driving down a rural road, on the way to a hot vacation destination, or headed down your local highway, there will be billboards. Someone owns that space. And someone gets paid handsomely for letting businesses use that space to attract their customers. Why shouldn’t that someone be you? Is your money working for you, or are you working for money? If you’ve got capital sitting in a bank account accruing around a 1% interest…your money isn’t working for you. If you’re risking your hard-earned dollars in the stock market for a measly payout (and some hard losses along the way)… your money isn’t working for you. If you’re flipping houses, buying businesses, investing in cryptocurrency, or any of the other million things out there but still not seeing a return on your time and money… then your money isn’t working for you and it’s time to look for something new. You’ve worked hard for the money you have, and it’s time to put it to WORK. That means finding a way to grow your money to support the lifestyle YOU choose… without high risk, high initial investment, or even a lot of labor. Or, you could stick with all the other options out there and spend endless time, money, and opportunity while your money just sits and never grows. Luckily, there IS a business that allows you to make your money work for you and grow. Building your own billboard business requires very little start-up capital, a bit of legwork, and then you just sit back and relax while you get paid regularly. You can find new billboard locations, and obtain ground leases and permits for them. You can then sell the ground lease and permit to other billboard companies (there are normally about two or three huge, public companies in every city) at phenomenal prices. On the low end, you can get $5,000 to $15,000. On the high end, on a very desirable location, you can get $100,000 or more. That’s right, you can buy a house from the proceeds of selling one un-built billboard location. And that’s not some boast from a cheesy late-night “get rich quick scheme” infomercial. It makes sense for large companies to obtain their locations in this manner, and they are happy to pay big bucks for them. Billboards return about 20% on your investment, which is significantly more than double what you’re going to earn from the stock market… and without all the labor-intensive work in traditional flipping. The beauty of the billboard business is the complete lack of massive capital investment. Even if you spend an entire week working full-time to search for a billboard location… you’re still out just a bit of time and a little gas money. And that’s only if you don’t find the right one. Doesn’t that sound a lot better than waiting for your money to slowly grow in a bank somewhere? And now, for the first time ever, I’m pulling back the curtain on how exactly to build your own billboard business from A to Z. 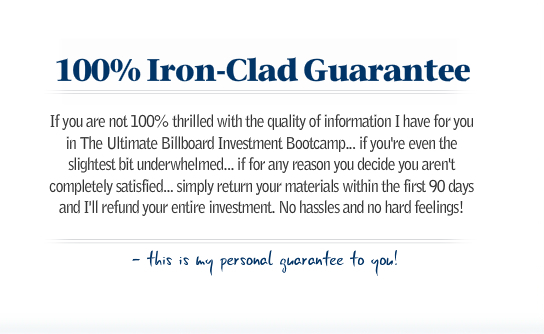 For the first time, you can access all the information I have in my brand-new Ultimate Billboard Investment Boot Camp. 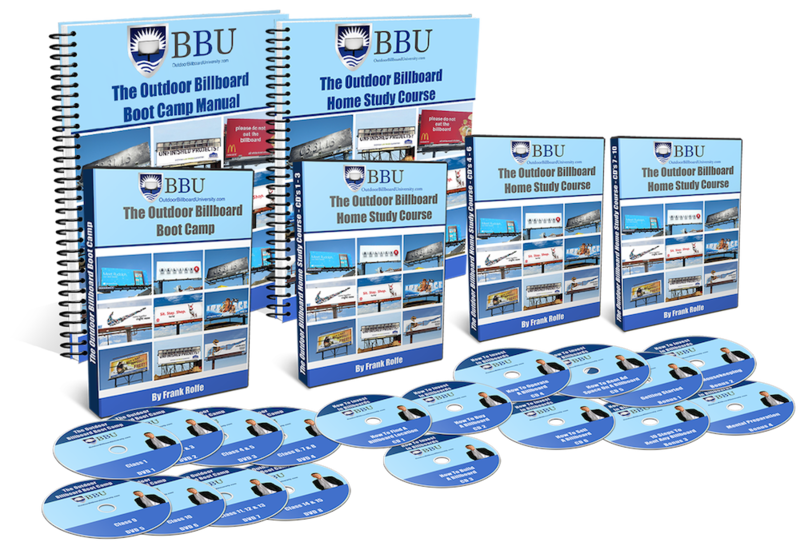 This Boot Camp encompasses literally days worth of information that will show you step-by-step-by-step what to do to build your own billboard business. 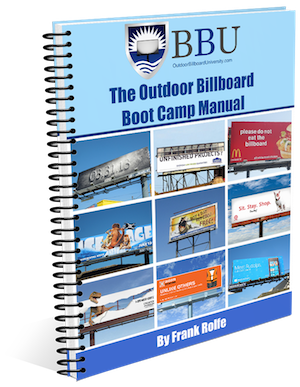 First, you’ll get The Ultimate Outdoor Billboard Boot Camp Manual. This manual, a whopping 309 pages in length, will show you exactly how to find, secure and profit from billboard locations in your town. How to determine the actual economics of your new business from your income to expenses (and how you can calculate your profit easily!)…. 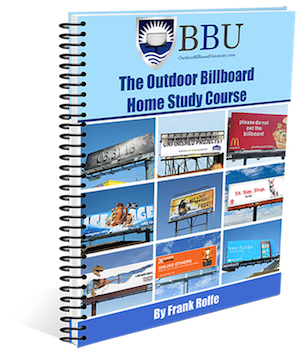 This manual has a value of over $997.00 on its own and is by far the definitive guide to creating your own billboard business from scratch… but it’s only ONE of the components of my Ultimate Billboard Investment Boot Camp. These audios will go in-depth on each topic so you can learn how to build your business on-the-go- in the car, during your workouts, or even while you’re sitting on a beach drinking a fru-fru cocktail. Alone, these audios are worth $497.00… but they’re included as part of The Ultimate Billboard Investment Boot Camp. Next, I’m also going to give you 15 full-length videos that will show you how to build your billboard business from scratch. This information is the same information that I provided in my in-person Boot Camps… but now you can access it without travel, time away from your family, sleepign in a lumpy hotel bed, or sitting in a freezing cold conference room frantically taking notes so you don’t miss anything. You’ll be able to attend this Boot Camp from the comfort of your own home - and you can pause, rewind, and rewatch as many times as you’d like to make sure you don’t miss a single bit of information. Plus a special section on how to buy a billboard and how to bring an abandoned billboard back to life. This system will hand you the short cut that you need to get started… the short cut I wish I had in 1982 when I started my own billboard business. Before I tell you what else is included with the Ultimate Billboard Business Boot Camp, I’d like to tell you why I’m the right person to be teaching you how to run this business. 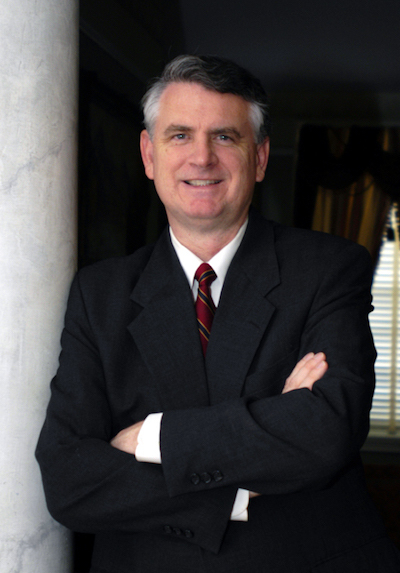 My name is Frank Rolfe, and in 1982 I graduated from Stanford University with a degree in Economics. Now, there’s not a whole lot you can do with that, so I was going to go on to business school and get an MBA. And in order to get into business school, I was going to start a business to write about my experience on my application. I decided to start a billboard business. After the first year, I had three billboards, but I had a bunch more pending, so I decided to go one more year and try to get to an even ten. By the end of the second year I was already over ten and heading for twenty, so I delayed applying for business school for one more year. You can guess what happened. I never went to business school, and I just kept building billboards. Not having any actual experience when I started, I had literally no idea what I was doing. But fortunately, I had some mentors along the way, particularly some guys at Foster and Kleiser (then the largest billboard company in the U.S.) who just couldn’t stand watching all the mistakes I was making. And I mostly learned through trial and error. Back then, the competition in the industry was fierce, with over 60 billboard companies alone in Dallas (today there are less than ten). So I had to use my wits and creativity to beat the competition. Little did I know that those tricks and shortcuts would lead me to jump ahead of everyone. 14 years later, I was the largest private owner of billboards in Dallas/Ft. Worth, and sold out to Universal (now Clear Channel) for $5.8 million. What did I learn from that experience? Certainly, I learned that there’s big money in billboards. But I also learned that there are two ways to approach every task: the smart way and the dumb way. The smart way gives you the advantage, is highly efficient, and puts the odds in your favor. The dumb way wastes a lot of time and rarely wins. By developing “smart” ways to approach the business, I was able to do some amazing things that nobody had done before, such as maintain an 80% rate of renewal, and a 100% occupancy rate for a decade straight. The Ultimate Billboard Investment Boot Camp includes all of the “smart” theories I developed, as well as the reasoning behind them and how they work in real life. like The Ultimate Billboard Investment Boot Camp. Are more than enough to get you started the right way. But I’m not going to stop there. My EXACT contracts, permit applications, owner letters, and billboard setups that made me millions. I would have killed for a resource like this when I was starting out - someone who’d gone before me successfully to open their filing cabinets and show me what needed to be done. So I’m doing the same for you. If I was selling this bonus as a stand-alone product (which I would never do), I’d sell it for no less than $500.00 - but it’s yours FREE when you invest in the Ultimate Billboard Investment Boot Camp. Every form, sample, and swipe that’s in the Look Over My Shoulder manual is in editable format for you to use in your own business. Simply fill in the blanks, make sure the company information is correct… and you’re ready to go! literally have everything you need to get started TODAY. Again, if I was going to sell this as a standalone resource (which I wouldn’t), I’d charge no less than $500.00. These documents are just too valuable to let it go for any less than that. Now, My Fast-Builder Bonus #3 will help you CONTINUALLY run your business and grow beyond where you could get on your own. Every month, I meet with my students to teach on new strategies, field questions and concerns, and help them grow their businesses using my methods. These calls are invaluable for keeping up with regulations and simply having someone mentor you through the process of building your business. And when you invest in The Ultimate Billboard Investment Boot Camp… you’ll have lifetime, ongoing access to these calls every single month. These calls contain PRICELESS information that you simply cannot get anywhere else. No forum, Facebook group, or Google search will unearth the information that’s in these coaching calls. And you’ll have instant access to all of them when you invest today. The monthly fee for these coaching calls is $97.00 (or $1,164.00 per year)… but your ongoing access is included with The Ultimate Billboard Investment Boot Camp. 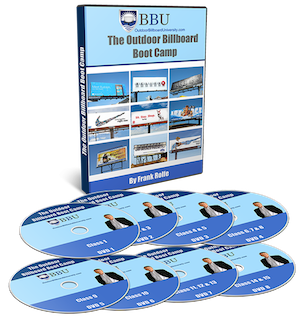 That means the total value of The Ultimate Billboard Investment Boot Camp is OVER $4,455.00. But, I told you earlier in this letter that starting a billboard business can be done without a large capital investment. So I’m not going to charge you $3,291.00 for this information. I’m not even going to charge you HALF that. Not remotely close. The total retail investment for the Ultimate Billboard Investment Boot Camp is just $1097. And if you were reading this letter at any other time, that would be your total investment to discover how this business can literally change your life (it changed mine)! But right now, I’m slashing a full $500.00 off the price. Your total investment TODAY is just $597. PLUS you’ll get hard copies of all of these materials delivered right to your front door. The manuals, the CDs, and the DVDs will be delivered right to your lap. And the Resource Library and Coaching Call Archive Library can be easily found right online. And right now, I am going to let you break the purchase into 3 monthly payments at no extra charge to you! If you don’t believe that this is simply the easiest way for you to build a business that makes your money work for you… just see what some of my students have to say…. "I started looking for billboards about a year ago, before I ever heard of your book. Your books showed me that I was going in the wrong direction. Now I am following what your book said, and i just signed my first lease"
"I wish you had more books, because I'd buy them all. They're a bargain"
"I turned the Billboard Boot Camp into over 200 billboards in Canada. 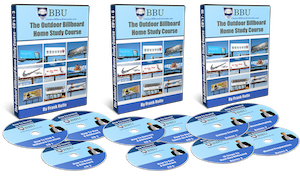 Of those who have ever profited from this course, I must be #1"
"The Billboard Boot Camp changed my life. I now own 12 billboards and have a significant enough income stream to retire on - and I did it all in two years. Thanks Frank for making this possible"
"I just signed my first billboard lease, thanks to your book. I followed your directions and now i have my first billboard. It worded just like you said in your book." I’m removing 100% of the risk and you’re getting 100% of the reward. I know there are a lot of options out there for you. I know that you could choose any one of a million ways to invest your money. But don’t you want to make a choice that has a high rate of return? Don’t you want to put your money to good use so you can enjoy the life you’ve spent so long working to create? Billboards aren’t going anywhere. As long as there are roads - there will be advertising next to them. Why shouldn’t you get a piece of that pie? P.S. Remember, you’ll get all of these materials delivered right to your front door. The hard-copy manuals, the CDs, and the DVDs will be delivered right to your lap. And the Resource Library and Coaching Call Archive Library can be easily found right online. You’ll be building your business from the comfort of your very own home in no time! Then you simply cannot afford to wait.